Perfect symmetry. It’s a meteorological term that describes the structure of a classic hurricane. A perfect doughnut-shaped eye wall filled with clouds ranging from 50,000 to 60,000 feet height in all sectors circling swiftly around a deep and tiny central eye. In a textbook, the term perfect symmetry is innocuous. In an actual hurricane, the result is horrific. As Haiyan did the seeming impossible and became better organized late Wednesday and early Thursday, a perfectly symmetrical eye wall developed over waters in excess of 80 degrees (F) and in an atmosphere boasting little or no wind sheer. By noon on Thursday, this perfect structure allowed more efficient evacuation of air through a deep and perfectly clear eye, pulling winds of ever-greater strength through its encircling storms. Explosive winds of a strength equivalent to a strong tornado, at 190 mph (US Navy showed 195 mph at 2 PM EDT), blasted around the storm’s center as its minimum pressure fell to 904.5 millibars — 40 millibars more intense than Hurricane Sandy (latest estimates show pressures as low as 858 mb, the lowest ever recorded). Haiyan’s wind field is now the strongest measured in any hurricane since at least 1980, when Hurricane Allen briefly exploded to 190 mph intensity. The difference between Haiyan and Allen is that the storm’s fury was mostly vented on the open waters of the Caribbean and Gulf of Mexico. In contrast to Allen, it increasingly appears that Haiyan will peak in intensity right before impacting millions in the Philippines. Given the more recent measures, it is possible that Haiyan has left even Allen behind, surpassing even the strength of the strongest storms ever recorded — Camille and Tip. It is difficult to overstate the danger of this situation. 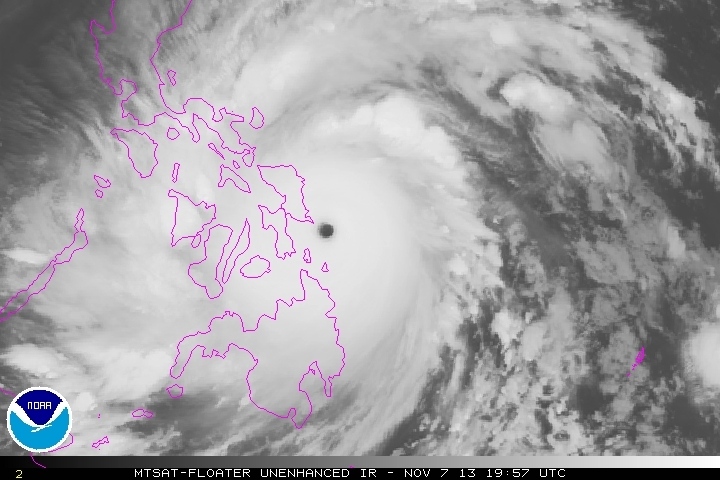 Haiyan is now more powerful that Andrew and Katrina. 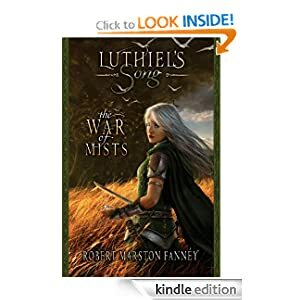 It is likely a rival of even Camile’s amazing intensity. All interests in the path of Haiyan should rapidly respond to any evacuation orders as this is an extraordinarily dangerous and powerful storm. Haiyan is currently located about 100 miles east of the Philippine archipelago’s eastern edge. It’s very rapid forward motion of 25 mph will bring it over land within the next 4 hours. Over the next day, it should continue to churn over or near numerous Philippine islands before exiting the archipelago late Friday. Current forecasts predict Haiyan will maintain category 5 strength for much of this period, dropping to 150 mph, a strong category 4, as it exits the Philippines. Over the next few days, Haiyan is then expected to threaten Vietnam or southeast China as a strong category 2 or category 3 storm. (Haiyan made landfall near Guiuan at about 4 PM EST). The above Modis shot shows Haiyan strengthening early Thursday morning as it began its final rush toward the Philippines. 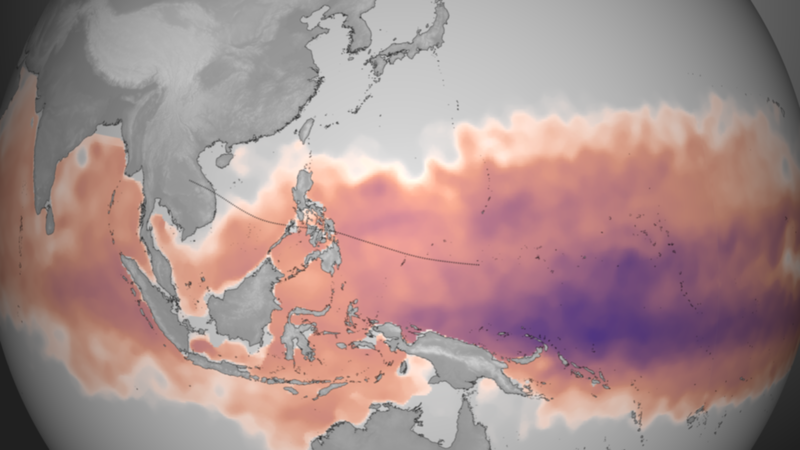 Very hot ocean waters ranging from 1 to 5 degrees Celsius above the 1980-2000 average throughout much of 2013 have spawned numerous severe weather events throughout the Western Pacific. On January 1rst, the first tropical cyclone of 2013 formed, not waiting even a day to begin what would prove to be an explosive, record season. 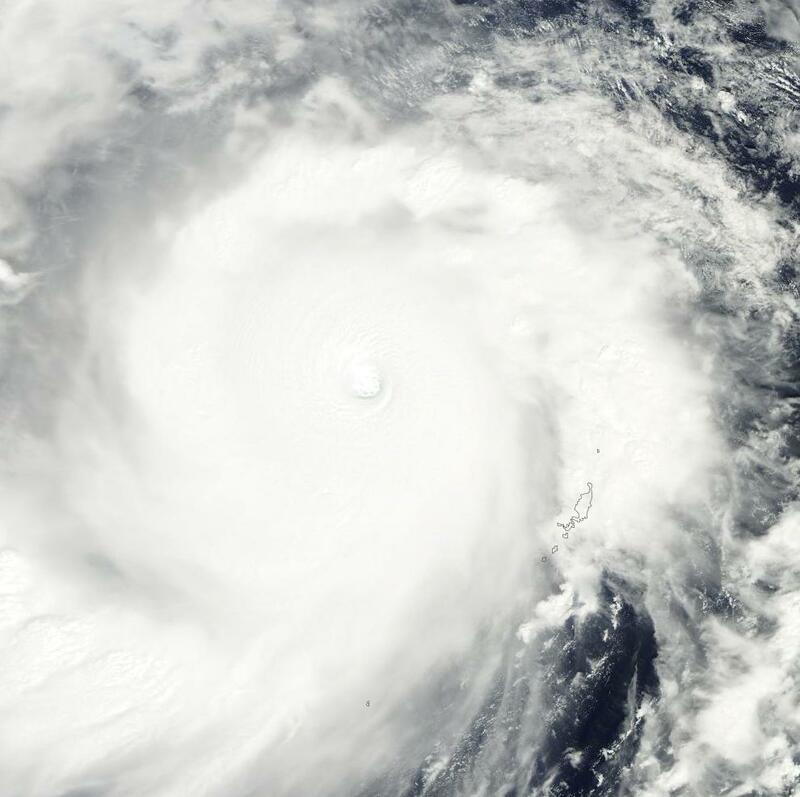 Throughout 2013, cyclones continued to form so that by November 81 cyclones had ripped through this region of the Pacific. Of this number, 38 storms were tropical depressions, 30 were tropical storms, and 13 were hurricanes. Four of these hurricanes were category 5 monsters. During late summer a powerful tropical storm combined with a monsoonal flow to drench Manila in record rainfall, flooding much of the city. Other strong storms also impacted the Philippines, setting off landslides and numerous record flooding events. Haiyan is just the most recent and strongest example of a series of powerful storms impacting the vulnerable island chain. Hot Pacific Ocean waters in a region north and west of the Philippines were also implicated in a major heatwave that resulted in scores of deaths throughout China, Korea, and Japan. This unprecedented ocean heat dome resulted in highest ever recorded temperatures with records being shattered consecutively, day after day, for up to two weeks in some locations. Ocean heat temperature maps seem to be painting a bulls eye on the Western Pacific. 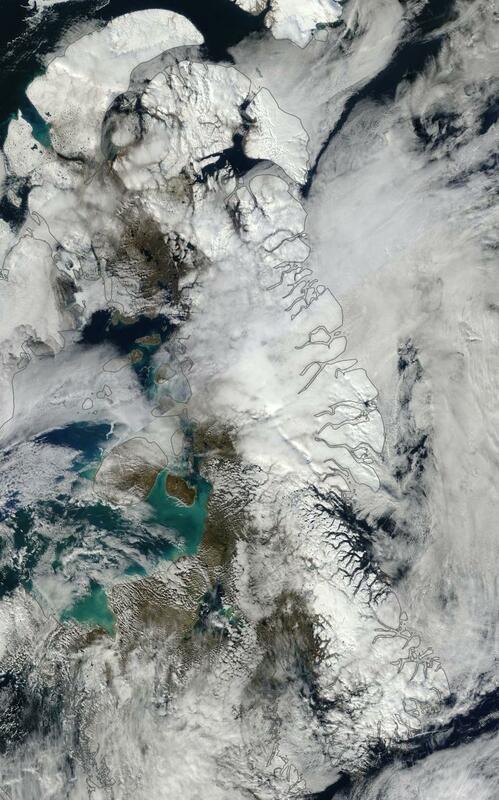 And, for 2013, large swaths of water in this area continued to boast temperatures in excess of 90 degrees (F). This abnormally hot water enhanced evaporation and fueled various extreme weather events including the massive spate of tropical systems as well as the record floods seen in the Amur region of Russia and China. As with many other extreme warming events, the regional warming seen in the western Pacific cannot be entirely separated from an ongoing global warming trend. August of 2013 boasted the world’s hottest ocean temperatures ever recorded. September 2013 tied 2005 for the hottest September on record. Extreme heating provides more energy for storms, droughts, and other extreme weather events. For each degree Celsius of global temperature increase, the hydrological cycle (the rate at which water evaporates and precipitates) increases by around 7 percent. Such an increase makes droughts more extreme even as it provides added heat and moisture fuel to increase the intensity of storms. Many scientists are now attributing the increased strength of storms over the past decade and becoming particularly intense in recent years, to the ongoing and amplifying impacts of global warming. In this case, scientific conservatism is slowly giving way to both the observed impacts of global warming and a lengthening string of increasingly intense events that continues unabated. As seen in the above seasonal temperature graph, a large area of ocean surface waters have remained at or near 90 degrees (F) for an extended period. These temperatures are about .5 to 2 C (1-3 F) above the climatological average seen from 1980 to 2000. They are about 1-3 degrees C above averages seen in this region during the 1880s, as human greenhouse gas emissions began to ramp up. This pool of very hot water is enormous, larger than the land area of Australia, and it has continued to provide fuel for powerful weather events over most of the past year. Since hurricanes can form in water temperatures exceeding 75 degrees (F), this expanding warm water region is resulting in a near continuous energy potential for the development of these storms. And this hot pool of water will continue to warm as human greenhouse gasses continue to ramp up, likely eventually resulting in a time when the Hurricane season, at least for the Western Pacific, never comes to an end. Intensity observations, all now based on satellite, show no abatement of Haiyan’s impressive fury. Cloud heights, symmetry and lightning frequency in the eye wall still show an extraordinarily powerful storm. Current estimates have Haiyan maintaining 190 mph maximum sustained winds with gusts to 230 mph.These maximum wind totals are comparable to that of a powerful tornado, with the strongest hurricane wind field extending out 50 miles from Haiyan’s center. Analysis at Weather Underground by Dr. Jeff Masters raises the possibility that Haiyan may now even rival Super Typhoon Tip’s record minimum central pressure of 870 millibars. If this were to case, Haiyan would be the most powerful storm on record. Since we have no direct observations, however, there is no way, as yet, to confirm this analysis. At the very least, it is likely that Haiyan rivals the most powerful storms on record since at least 1969 — Camille, Tip, and Allen. Landfall storm surges of 15-20 feet with 15-25 wave heights are expected. Sea surface temperatures at 85 to 86 degrees (F) and near zero wind shear in the region are conducive for continued extreme storm intensity. Rainfall totals are expected to exceed 8 inches along the path of travel and 50 miles out from the center. Consistent inundation with heavy rainfall events over recent months, including a recent tropical depression, have left the ground in areas along Haiyan’s projected path saturated and very vulnerable to flooding. So high risk of flash floods and landslides remain a serious threat. Expected rainfall totals are somewhat suppressed by Haiyan’s fast forward motion at 25 mph to the WNW. But rainfall in excess of 2 inches per hour is, nonetheless, likely to result in extreme flood risk. 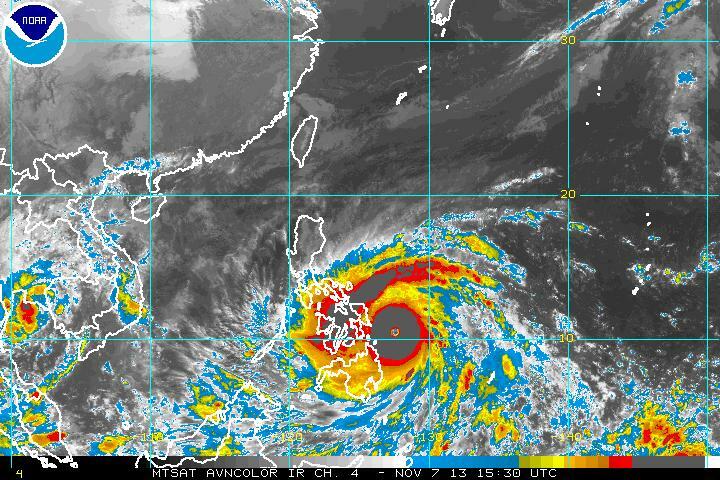 Emergency management officials are urging millions to evacuate regions closest to Haiyan’s path. Manilia is expected to be grazed by the storm, experiencing tropical storm force winds and rainfall totals around 4-8 inches. Any deviation in Haiyan’s expected path could drastically change these forecasts. Haiyan is more powerful than hurricane Megi, a 2010 storm that boasted 170 mph winds and resulted in hundreds of millions in damages and a heavy human toll. Haiyan is now making landfall on the Guiuan Peninsula a coastal community with a population of 48,000. Preliminary pressures in the area are showing 992.5 mb. The storm’s strongest winds are now starting to impact the Eastern Philippines with Leyte, Tacloban, and Borongan in the bull’s eye. A wind speed measure one hour ago showed sustained winds in Guiuan at 96 mph. Winds in the area are likely much stronger now. Very tough 18-24 hours ahead. Unconfirmed pressure reading at 889 mb via handheld near Guiuan at 5:01 AM. US Navy data showing 196 mph storm with 235 mph gusts and maximum significant wave heights of 50 feet 6 hours ago (H/T to Colorado Bob). Preliminary Satellite estimate shows Haiyan bottomed out at 858 mb minimun central pressure. Source: WGN Chicago. If true, this would make Haiyan the strongest storm ever recorded. Weather station in Guiuan no longer reporting. In all honesty, I wouldn’t be surprised if that little spit of land is all under water now. The intensification of Super Typhoon Haiyan is being fueled by “ideal” environmental conditions – namely low wind shear and warm ocean temperatures. Maximum sustained winds are currently at 195 mph, well above the Category 5 classification used for Atlantic and East Pacific hurricanes. Plotted here is the average Tropical Cyclone Heat Potential product for October 28 – November 3, 2013, taken directly from NOAA View. This dataset, developed by NOAA/AOML, shows the total amount of heat energy available for the storm to absorb, not just on the surface, but integrated through the water column. Deeper, warmer pools of water are colored purple, though any region colored from pink to purple has sufficient energy to fuel storm intensification. The dotted line represents the best-track and forecast data as of 16:00 UTC on November 7, 2013. The extra depth of the warm water added further fuel for intensification because cyclones tend to churn up the water, bringing cooler water up from the deep ocean. This action tends to cause the storm to weaken over time, as it brings up cooler and cooler water or as it crosses the paths of other storms. But if water at depth is warmer, one key factor that can weaken storms is removed. 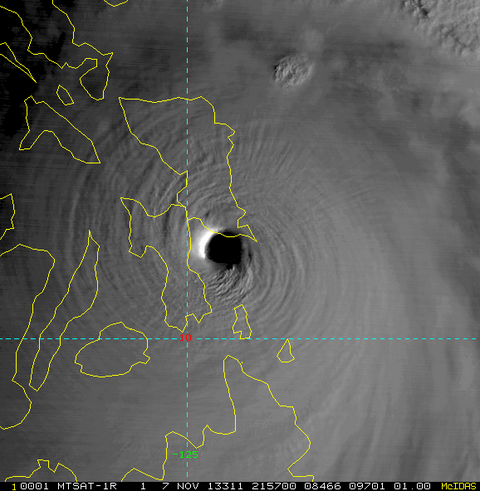 Yet another ‘perfect storm’ satellite shot of Haiyan. This one showing amazing stadium effect at landfall. Satellite imagery shows Haiyan passing into the central Philippines. Cloud tops are warming somewhat as the storm is disrupted by the surrounding land mass. Overall, this shows weakening and maximum sustained winds are now estimated to have fallen to around 185 mph or less with pressures rising to around 895 mb. Still a very intense storm, but at least one that is now showing some weakening. 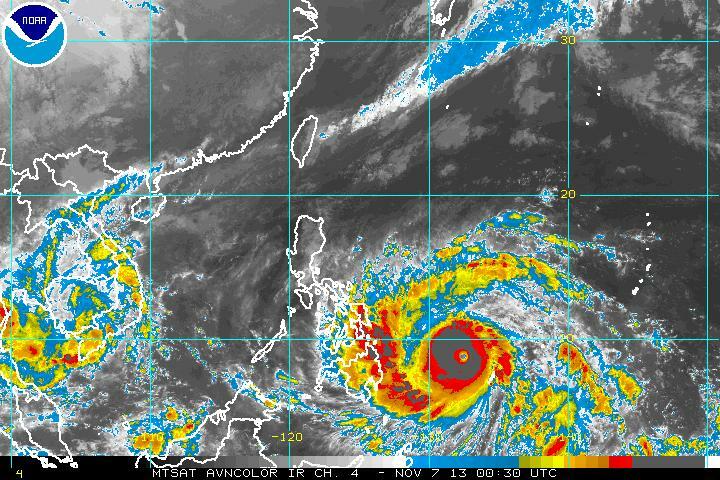 Haiyan exited the Philippines today as a 155 mph category 4 storm. Damage reports are now mostly sporadic. Currently, few have been able to access the hardest hit areas due to fallen trees blocking roads. It’s now around 1 am in the Philippines, so assessments of hardest hit regions will likely begin to trickle in later today. Most likely, the areas of highest impact were located within the eyewall itself — a 10-20 mile region directly surrounding the eye — and in areas near or close to where the storm made landfall. At its most intense the storm was estimated to have 195 mph maximum sustained winds. As the storm crosses the coast, this wind field tends to destabilize and form micro whirls which act in a manner similar to tornadoes. If the wind field was as strong as estimated, it is likely that tornado-like damage was inflicted directly in the path of the storm, especially within a 10-20 mile zone in the storm’s right-front quadrant. Again, as yet, there have been few reports from the hardest hit regions due to difficulty accessing those zones and we will have to wait until daylight before gaining a more accurate assessment of the damage. 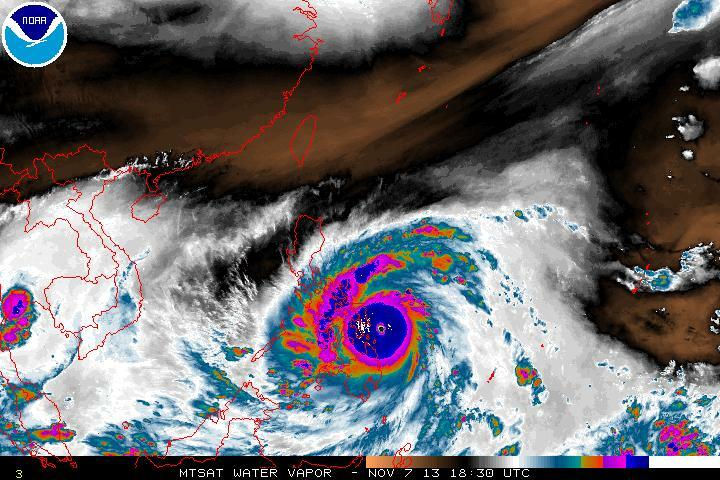 Forecasts are currently calling for Haiyan to slowly weaken as it moves over cooler waters. That said, it appears the storm will make landfall as a Category 2 storm in the region of Vietnam and Southeast Asia. There it is likely to emerge as a major rain event. Super typhoon Haiyan, boasting maximum sustained winds in excess of 175 miles per hour, is bearing down on the Philippines and is expected to make landfall there early Friday morning. The storm is then expected to spend the day ripping through the Pacific archipelago before exiting the region late Friday. The storm reached category five status on Wednesday as when its wind speeds exploded from 120 mph early in the day to exceed 175 mph by around midnight. Category 5 hurricanes are the most powerful storms on Earth so interests in the Philippines should be very concerned at the approach of this deadly and dangerous storm. Officials in the US have already compared the storm to Hurricane Andrew, one of the worst storms to affect the US. But poor building practices in the Philippines will likely make structural damage impacts even more destructive along its immediate path of travel. Current predictions show Haiyan making landfall as a 165 mph storm, spending an entire 24 hour period tracking over the Philippines and then exiting as a 145 mph storm about 50-75 miles to the south of Manila. Millions of people are in the track of this storm so any in the path of this extremely dangerous storm should take every precaution and keep in contact with news broadcasts from local emergency management officials. The Western Pacific has boasted both record hot water temperatures and extraordinarily intense storms throughout the summer and fall of 2013. Of 4 category 5 hurricanes forming over the Earth’s oceans this year, all have formed in the Western Pacific. In total, 13 hurricanes, 30 tropical storms and 38 tropical depressions have affected this region of the world, a nearly unprecedented number. Water temperatures remained warm enough to facilitate the formation of these powerful storms throughout the year, with the first one forming on January 1rst. Ocean water temperatures in the upper 80s F (near 30 C) and about 2 degrees above the climatological average, helped fuel the immense storm now bearing down on the region. The Philippines has already been impacted by a number of storms this season. But Haiyan may prove the most devastating yet. Excessively hot water temperatures were also implicated in one of the worst heat waves to hit China in recent history during late July and early August. Extraordinarily hot surface water temperatures in the region are likely to continue to produce powerful weather systems over the coming weeks, months and years. After hitting a new record high above 400 ppm during the latter weeks of May, 2013, CO2 followed seasonal trends by falling to a new record high low of around 393.5 ppm in early October. By early November of 2013, CO2 had rocketed back to 394.4 ppm and, if current trends continue, will likely touch 402 ppm or higher by May of 2014. Over the past few years, worldwide CO2 values have risen by an average of around 2 parts per million each year. But in 2013, the trend line steepened, with values increasing by about 3 ppm between 2012 and 2013. Should the new, more rapid, pace hold through 2014, maximum CO2 values for that year will reach between 402 and 403 parts per million by late May. In context with the known geological record, the current pace of CO2 increase is far faster than anything previously observed. Past major warming events, at most, hosted a yearly CO2 increase of around .35 ppm. The most recent rate of 2 ppm per year, on average, is about six times as fast. 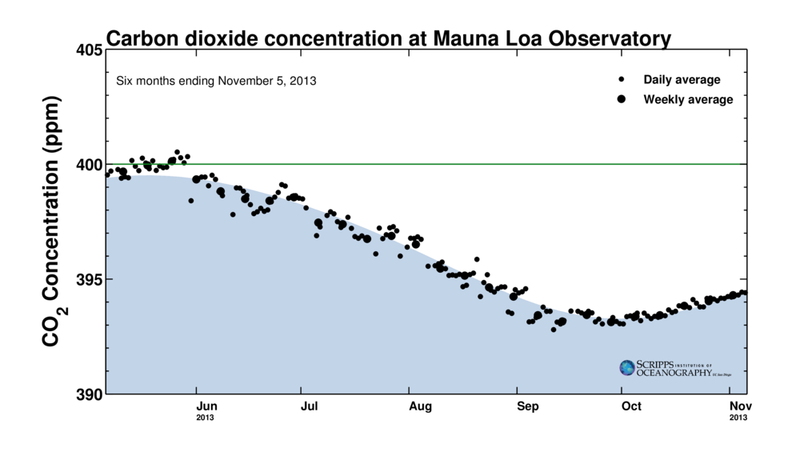 A yearly increase of 3 ppm is nearly eight times this total. It’s worth considering this amazing fact: human emissions are more rapid now than anytime in the geological past. Nothing, not the PETM, not the great flood basalts of the Permian, exceeded the current rate of human burning. And those great past events, many coinciding with the worst mass extinctions, were 1/6th to 1/8th the pace of what humans are doing now. Our CO2 injection machinery is more powerful, by far, than even the most terrible forces ever produced by nature. This screaming pace of CO2 increase is leading to a series of unprecedented and damaging climate, weather, and Earth systems changes. Changes we are just beginning to understand. At the very least, we have projected ourselves into climate territory not seen in the last 3.6 million years — the last time CO2 levels were as high as they are bound to be over the next ten years. And that’s if we are somehow able to halt global CO2 emissions soon. If human emissions continue to increase as they have over the past decades, by mid century, we could be looking at atmospheric CO2 levels not seen in the past 15 to 30 million years. By the end of this century, we could achieve an atmospheric state not seen in at least 55 million years. It is not just the scale of the change, creating levels of CO2 not seen since ages in the Earth’s deep past, it is the pace of this change which is so immense and dangerous. According to the most recent IPCC draft report, the current increase in CO2 levels is causing an increased heat forcing of .16 watts per meter squared at the top of the atmosphere every six years. By comparison, the grand solar minimum experienced during the Little Ice Age had a negative forcing of around .15 watts per meter squared. So we now have the equivalent to a Little Ice Age, but on the side of hot, being pumped into the Earth’s atmosphere every six years. And should the sun cool to another grand minimum, it would take only about six years of current human emissions to overwhelm its cooling effect. Should we hope to see a continued progress of human civilizations this extraordinarily rapid and dangerous pace of human CO2 emissions is an issue that must be addressed immediately. 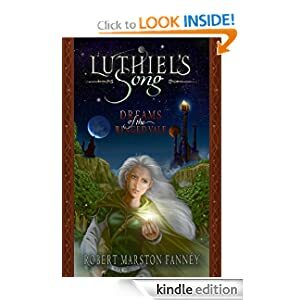 We have likely already created a serious and devastating string of events that will continue to unfold and worsen over the coming decades and centuries. Some, we have already seen, but these are the earlier, more mild, outliers, the events we locked in 20, 30, 50 years ago. So the force of events 20 years, 30 years, 50 years from now will be proportionately worse. Continued emissions and further increases, under such a scenario, is not a survivable option. If we are to continue, to have any hope for future progress, we need to halt this mad pace of emissions as soon as possible. According to NASA’s most recent global land and ocean surface temperature survey, September of 2013 was .74 degrees hotter than the 20th Century average. This measure ties September of 2005 as the record hottest. The difference between 2005 and 2013? 2005 was an El Nino year. A year when a large swath of the Eastern Pacific was dumping its heat content into the atmosphere. This year, the Eastern Pacific has remained somewhat cooler than normal, sucking a degree of atmospheric heat out and dumping it into the deeper oceans. But, despite what would normally be a drag on global surface heating, the world’s temperatures where the air contacts the land and the sea remain at or very near new record highs. This situation is not cause for comfort or complacency. Nor is it one that indicates what has been termed a so-called ‘pause in global warming’ by so many ill-informed in the media. To the contrary, what we are seeing is that the natural variation of El Nino to La Nina — variations that for centuries and millenia have primarily governed to world’s periodic warm and cool spells — is slowly being overwhelmed by the human greenhouse gas forcing. What we are witnessing is ENSO neutral and La Nina years and months coming very close to and reaching record hottest temperatures. So the rhetorical question we should all be considering is this: if we are experiencing record high temperatures now, when the Eastern Pacific is relatively cool, what happens to the global record when ENSO again starts to heat up? And, in any case, ENSO or no, it appears increasingly clear that more new record warm years are now in the offing. NOAA’s own set of temperature measures also show record heat, with worldwide temperatures ranging 4th highest for the month. The NOAA reading, which varies slightly to the NASA reading due to a difference in measurement methodology, follows a June measure in which the world ocean system tied 2010 for hottest on record. NOAA’s global temperature map found hotter than average readings covering much of the globe throughout September. Record hottest regions blanketed Australia, Iran and Afghanistan, a large section of the Arctic Ocean north of Scandinavia, and smaller, more isolated patches around the globe. No region experienced record coldest temperatures. The only concerted regions experiencing cooler than average temperatures include a section of Siberia and Central Russia, and a region of the Southern Ocean between South America and Antarctica. The Eastern Pacific, which drives ENSO, remained cooler than surrounding waters at near or just below the 20th Century average. Between the NOAA and the NASA temperature measures, it remains clear that record or near record warmth continues to dominate the global climate with pools of hottest ever recorded temperatures continuing to drift over the world. Given the increasing warmth, despite no El Nino, it appears possible that, should El Nino not arise within the next 3-5 years (unlikely given a long history of variation), the world will achieve new record warm years without it. And such an event would be yet one more that is without precedent. A pool of slightly cooler than average water over a moderate stretch of the Eastern Pacific during early November belies a continuing trend of ENSO neutral or La Nina leaning conditions. This pattern has dominated throughout much of the past two years and, currently, shows few signs of abating. As one can see from even the most cursory analysis of the image above, the global ocean system, despite the slight coolness in the Eastern Pacific, remains significantly warmer than the already warmer than average period of 1971-2000 which provides the base set for the above NOAA graphic. One final driver to global heating during the months of September and August of 2013 appears to be a very warm late summer and early fall Arctic. Temperatures between the latitudes of 65 and 75 degrees North have been particularly warm with near record hottest and record hottest temperatures experienced in Scandinavia, regions of the Arctic Ocean north of Scandinavia, high north-west Canada, and Alaska. The Arctic Ocean in a zone between 70 to 75 North has experienced much warmer than normal conditions as sea ice remains between 4th and 6th lowest on record in all the various measurements. Meanwhile, temperatures above the 80 degree North Latitude line, though not hitting the same record variances are regions nearer the Arctic Circle, showed temperatures ranging between 2 and 5 degrees Celsius above average for the months of September and October. This dumping of ocean and land heat into the Arctic environment, which slows the cooling of the Northern hemisphere into winter, has become an increasingly dominant weather phenomena over the past 5 years. It is also an event that has coincided with record loss of sea ice which has become particularly pronounced since 2007, with some years showing as much as 80% loss of sea ice volume and more than 50% losses of sea ice area and extent since 1979. The resulting cooling lag in the Arctic during the months of August, September, October and November have, likely contributed to near record warm months globally during August and September of 2012 and 2013, despite La Nina or ENSO neutral conditions. This somewhat ominous signal shows that ENSO is in the process of gradually being over-ridden by other factors. Climate models have indicated that the Arctic would be the first section of the globe to experience very rapid and pronounced warming under human greenhouse gas forcing and the related and powerful feedbacks of Arctic albedo loss and environmental greenhouse gas emission (methane and CO2). And with summer Arctic temperatures, in some regions, measuring their hottest in more than 40,000 years and with worldwide CO2 levels pushing toward their highest levels in 3 million years, it appears we are, sadly, at just the very beginning of such a dangerous and powerful warming trend.